For the tenth year in a row, Webster University music students and faculty will give St. Louis a performance to remember with the “Gift to the City” holiday concert at Christ Church Cathedral in downtown St. Louis. This year, however, they've added an additional performance across the river, at the Cathedral of Saint Peter in Belleville, Illinois. 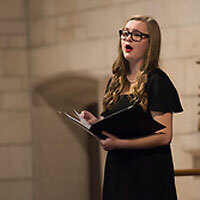 Webster musicians hold the popular concert in December each year with more than 100 students and faculty performing festive music to a standing-room-only audience. In a busy schedule of concerts and performances, this is the largest event of the academic year for the Department of Music in Webster’s Leigh Gerdine College of Fine Arts. Saturday, Dec. 8, beginning at 7 p.m.
Sunday, Dec. 9, beginning at 3 p.m.